C/De Los Juegos De Casablanca, S/N, 04131 Retamar, Spanien. 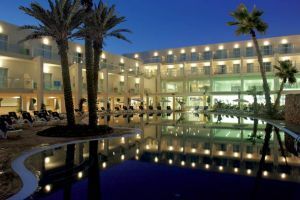 The Hotel Cabogata Garden and Spa is an exceptional establishment located next to the El Toyo beach and 15 km from the city of Almería and 7 km. from its airport. In this Hotel, luxury comfort and the most refined services and attention make every day of the holidays an unforgettable time of relaxation and pleasure. The hotel has all types of facilities and services, such as reception, lounge, lounge-bar, buffet-restaurant and air-conditioned cafeteria as well as the pleasant poolside bar.